Winter of 2014/2015 proved to be a challenging one for us. It was a rough winter to begin with–bitter cold, with little snow. 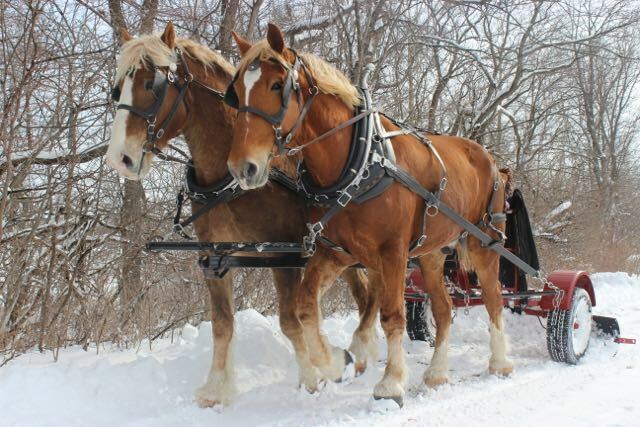 We had to cancel several of our scheduled carriage ride events due to the bitter, frostbite-inducing chill, which was a little hit from a financial standpoint. 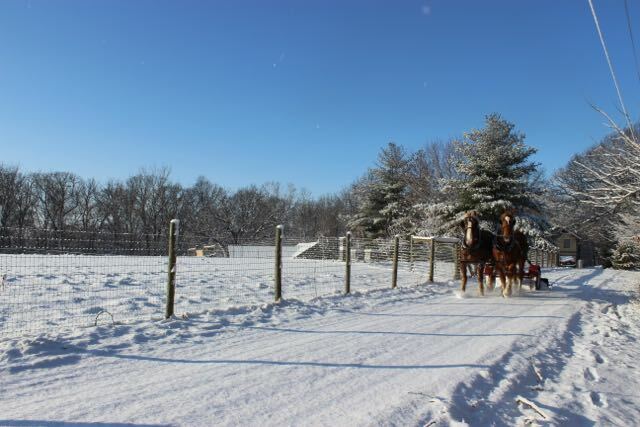 The ground was often iced over, preventing conductivity of our electric fences and risking bad slip/falls for the horses on our pasture slopes. As a result, we spent much of our time hibernating from the chill, trying to homeschool and get some indoor projects completed. One day, we finally got a bit of snow, and it was warm enough (finally in the double digits! ), so the kids decided to go sled. Somehow, while inspecting the kids’ sledding attire–coat, check! gloves, check! hat, check!–I missed the fact that R was wearing tennis shoes with no socks, rather than socks and snow boots. I decided to take the opportunity to work the horses. I had just gotten finished plowing snow and unharnessing the horses, when I heard a blood-curdling scream from R. About that time, I heard N say, “Her foot looks like Nick’s knee!” (referring to Nick’s injury, posted here). S and I came running at the same time, and by the time we arrived to the sledding area, R was already up and walking, well, limping, toward the house. A quick inspection proved that this was definitely worthy an E.R. visit. Many hours later, we returned home, not much worse off than before. It was determined that, in some freak way, while sledding, R had collided with a post, which wouldn’t have been all bad except that her body had slid forward, and the wooden corner of the sled had somehow wedged its way up inside her tennis shoe. The edge, blunt as it was, somehow managed to literally filet the top of her foot off by several inches. Thankfully, all parts were still there, and there was no ligament or tendon damage. The doc cleaned it up, sutured the skin back together, and she was ordered to stay of her feet for a couple of days. By the time the sutures came out the following week, the scar was the only sign of the trauma of that day. Remember I said it was an icy winter? Well, one day a month or so prior, we had an issue with the truck and trailer sliding down an icy hill and jackknifing. 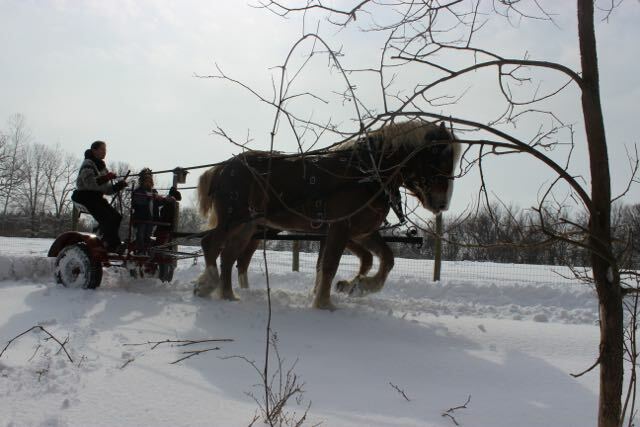 The horses were used to pull it out of it’s quandary, which was a pretty impressive feat, by the way! 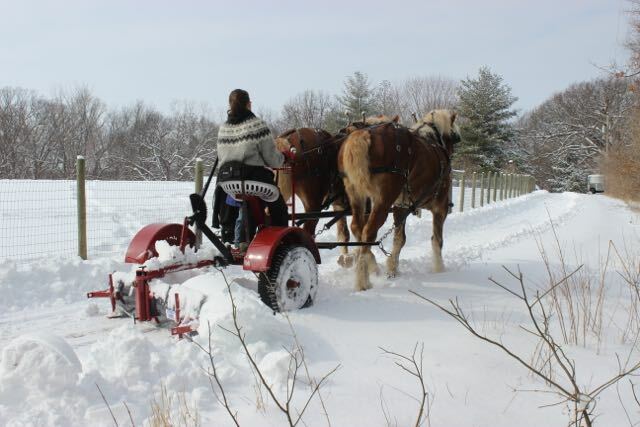 It was a Chevy 2500 pickup, in a very tight space, on ice, and the horses with their studded traction shoes, pulled that thing right out! The incident, however, resulted in our forecart (the red work cart we hitch to the horses) having to be shoved over the nearby hill to get the truck free. 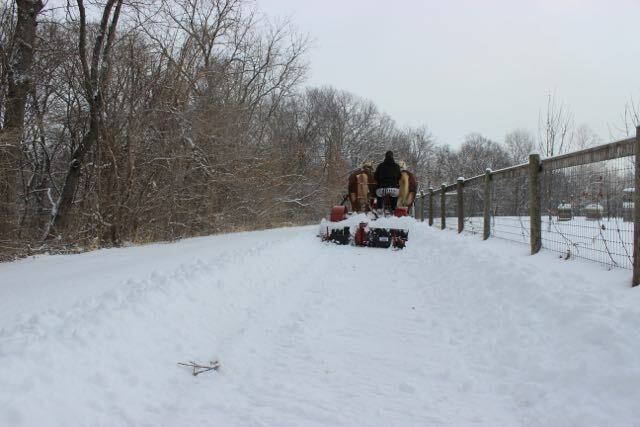 We didn’t get much of a break, when, a few weeks later, the weather finally improved enough to work the horses again. First, I needed to get my forecart out of it’s quandary. What happened next is a really long story, containing a few not-so-great decisions on our part, and involved chaining the rear of the forecart (the exposed area) to the horses and having the horses pull it up the hill. Theoretically, the idea should have worked, but the worst decision was turning the brake off, which in turn allowed the wheels to turn freely. This creates an unstable mass (in S’s engineering terminology!). When you combine an unstable mass with a certain horse we had at the time who had a lot of “GO!” and very little “WHOA!”……..well, we set ourselves up for trouble! I, as the driver, was safely positioned uphill. S, on the other hand, was safely out of the way until the horse sped up, the forecart became unstable and flipped quickly through the air, and S found himself trapped in a corner. He attempted to go the only open direction he had—straight up! This act (and a whole lot of God’s protection!) probably saved his life, but nonetheless, the roughly 500-lb forecart caught him mid-jump, scooped him up, flipped over with him and on him several times, and then dragged him up a hill. Mind you this all took mere seconds before I got the team stopped, but when it was over, we were all shaken. I had seen it all happen out of the corner of my eye, and feared my husband was dead. I had no choice but to stop the horses, who were slightly spooked at this point, before they bolted and created havoc on who-knows-what-and-whom. Once they stopped, I looked over toward S, and he gave our long-time sign of a raised hand to signal he was still alive and at least partly functioning. This gave me the time I needed to get the horses untangled and secured, while yelling instructions to the children on how to help their father. As soon as I could, I ran to S and my medical training kicked into high gear. I checked him over, looking for major breaks and areas of pain. He seemed beat up, but mostly OK, except for a very-rapidly-swelling foot and some blood coming out of his ear (not really a good thing). We assumed he might have head trauma and the foot was severely damaged, based on the fact that something had sliced through both his boot AND his sock, though interestingly the foot itself wasn’t cut. I ran back over, got the horses put away, called my mother-in-law to come babysit, and loaded S for the E.R. We live in one of those remote areas where sometimes it’s a better option to drive to the E.R. than to wait for the ambulance! Poor S was wincing in pain at every bump, railroad track, and turn we made. He hung in there, and we finally arrived. I ran in to tell the E.R. staff about his situation, and surprisingly, it was as if they were expecting him! A whole trauma team ran outside with a gurney, got him onto the gurney, rushed him into the trauma room, and within an hour, he had x-rays, a CT scan, and was examined by the attending doc, a plastic surgeon, an orthopedist, and I forget who else. By God’s amazing blessing, and an awesome E.R. staff, just 4 hours later, S hobbled out of the E.R., and headed home. Turns out his ear lobe had been sliced, but his brain was fine. His foot had some soft-tissue damage, but not a single break. His torso was covered in scrapes and bruises from the gravel driveway, but nothing there was broken. In fact, the only major damage was 3 fractures to his facial bones. He was put on crutches and told to wear a boot for a few weeks to give his foot time to heal, as the crush was pretty significant. In fact, he still suffers numbness from nerve damage almost 18 months later. I learned later how God had set everything into motion to take care of S, though. As it turned out, just before our arrival, the E.R. had been notified of a severe car accident involving some major trauma. There was some confusion, and they didn’t know details, but all the doctors and trauma team were ready to go, and the trauma room had been prepped. When we arrived, they thought he was the car accident victim at first, hence the speedy intake. Don’t worry, though, we didn’t endanger anyone else, as we found out later that in all the confusion, the other victim had been taken to a different hospital and our hospital had been mistakenly notified. It all worked out for the best, just as our Lord promises! Once again, I’ve broken my own record for time away. Once again, I miss it, and figured I should check in. So much has been happening around the farm, I don’t even know where to begin. It seems to me some fun photos would be a good place to start. We are still suffering through bitter cold and counting the days until spring. It was a dry winter until February hit, and we finally got snow. And the snow just keeps coming every couple of days. An inch here, 6 inches there. 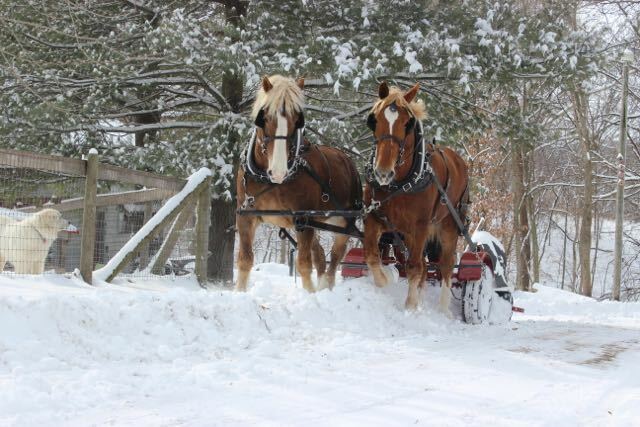 That might not mean much to you, but for me, it means I get to use the horse-drawn snow plow we bought last fall! Enjoy! !